All the wildfires that have hit the bulk of North America over the last 6 months make for a strikingly full picture when put together. 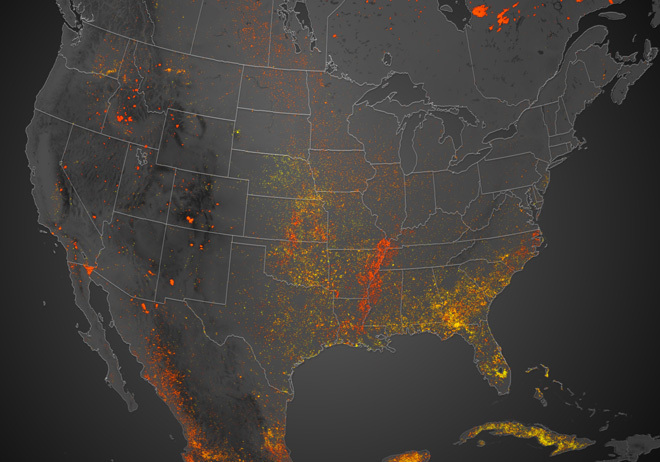 This new map from NOAA shows each fire detected by satellites so far this season. It’s important to note what this map is showing before you draw any conclusions, however. Each spot on the map represents a fire signature caught by a thermal sensor on NOAA’s GOES satellites. Every time a fire is detected, a new spot is added — this means when two different satellites see the same fire, two tiny dots are added. When the same satellite sees the same fire again, another dot. So far this year, fires have been spotted 323,828 times, but there have been just over 31,000 fires. So, while it looks like the Southeast has taken a relatively big hit, what you are looking at is related to the number of fires, not the acreage burned. The southern quarter of the country has only seen around 117,000 acres burn so far, as opposed to 2 or 3 million in some years. “What we’re seeing is the southern area just hasn’t seen as much of a fire season this year,” said Ken Frederick, spokesman for the National Interagency Fire Center. It’s not clear yet where 2013 will rank among the country’s worst wildfire seasons, but we are well behind last year, which was the third worst since the NIFC began tracking in 1960. This time last year, almost 7.3 million acres had burned, and so far this year, we are closer to half of that at 3.7 million. Last year’s total charred acreage was over 9.3 million. The record was in 2006 when nearly 9.9 million acres burned, and 2007 saw another 9.3 million acres go up. Though 2012 was close to a record for total area burned, the total number of fires was 67,774, which is well below the average of around 105,000. Fires are getting bigger. The number of individual fires this year is also behind last year, but not as far behind as in acreage — this year’s 31,258 fires is 71 percent of the 43,932 recorded by this time last year. This year is, however, already the deadliest on record since 2003. 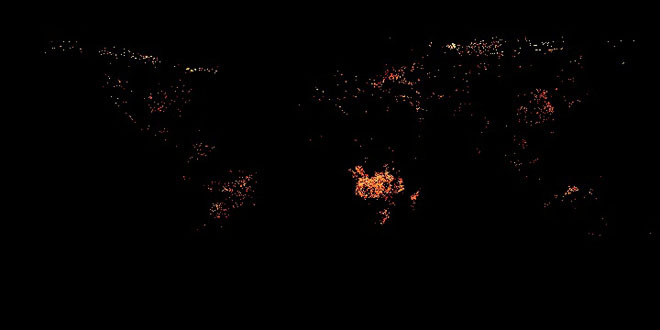 The map above highlights another trend. Fires later in the year are colored deeper shades of red, and you can see the highest concentration of fire detections moves generally from east to west with the highest numbers showing up in the southeastern U.S. and Cuba, shifting into the Midwest and then moving into the Intermountain West, California and western Canada. To add one more dash of perspective, the map below shows all the active fires picked up by NASA’s satellites during July 2013. The U.S. looks rather mild relative to Africa in this view. Images: Top: NOAA. Bottom: NASA. Hercolubus is coming. – Carlos Muñoz Ferrada Will War With Syria Cause The Price Of Oil To Explode Higher?